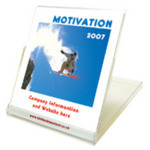 Our Customised CD case calendar is a CD case that opens up into a calendar for your desk. Large print area available for printing your details and logo. You won't get caught out not knowing what day it is with our Customised CD case calendar. So have your details printed on and be advertised. Other promotional and personalised items besides our Customised CD case calendar click here. Please call for a FREE QUOTE on our Printable 2019 CD case calendar TODAY! To find out more about our Customised CD case calendar click here and fill in the contact form and we'll get straight back to you.